The Michigamme rises at Lake Michigamme off US-41 northwest of Champion. Two stretches of the river are difficult to handle. The first is just after leaving the lake and the second is thee miles east of the Dickinson County line. Expect to portage these area. If you avoid these areas, put in at Floodwood, east of M-95. two miles south of the Marquette County line. 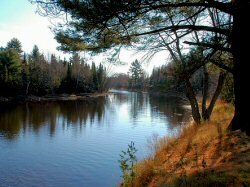 Eight miles downstream is an eight mile stretch of Michigamme Reservoir backwater. Portage Way Dam on the left shore. Farther downstream portage Hemlock Falls Dam on the right shore. Take-out points are found at Mansfield Bridge or at the new M-69 Bridge 3 1/2 miles downstream. Two more portages must be made, one at Peavy Dam and the other at Lower Michigamme Falls Dam. From there, continue down the Michigamme into the Menominee River. Ten miles beyond is the take-out point at Highway 607 Bridge in Dickinson County. Enjoy the Michigamme River by canoe or kayak or take a day trip using a guide or outfitter.